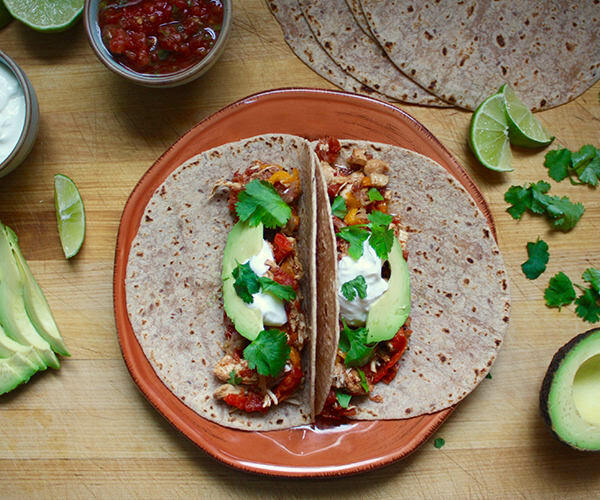 Have a fajita fiesta with maximum flavor and minimal effort with these Slow Cooker Chicken Fajitas. 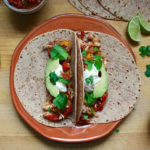 This chicken fajitas recipe uses a slow cooker to infuse tender chicken with the flavors of every ingredient, so each bite is bursting with bold taste. It’s so easy to make, just place all of the ingredients in a slow cooker, and press a button! Hours later, you’ll have a delicious dish that is healthy and packed with an impressive 31 grams of protein per serving. These slow cooker chicken fajitas are great for a simple meal prep that cooks itself while you prepare the rest of your meals for the week. The recipe makes four servings, but can easily be doubled to make a larger, time-saving batch. When it’s finished cooking, let the chicken mixture cool for one hour, then store in the fridge until completely cool. Spoon individual portions into containers or plastic bags for freezing. Place tomatoes, onion, bell peppers, chile powder, cumin, pepper, and lime juice in a 3-quart slow cooker; mix well. Add chicken; cook, covered, on low temperature for 4 to 5 hours (or on high or 2 to 3 hours), stirring once or twice, until chicken is cooked through and vegetables are tender. Evenly divide mixture between tortillas. Top evenly with salsa, yogurt, avocado, and cilantro. Heat 1½ tsp. olive oil to hot. Add 1 cup water, tomatoes, chili powder, cumin, pepper, lime juice, and chicken. Follow manufacturer’s guidelines for locking lid and preparing to cook. Set to pressure cook on high for 10 minutes. Add a side salad or veggies to make a great lunch.